In the year 450 BC, the Greek historian Herodotus wrote about the Hyperborea, a kingdom whose people were affluent and influential enough to transmit goods all the way from the northern reaches of Europe to the island of Delos in Greece. Their lives were described by the classical Greek poet, Pindar. Of the many writings of Hyperborea, most have been lost to time. Fortunately, the writings of Diodorus Siculus, a Greek historian of the first century BC, have survived. He preserved a fragment from another historian of the fourth century BC, Hecataeus of Abdera, who described the whereabouts of the Hyperboreans. “The Hyperboreans also have a language, we informed, which is peculiar to them, and are most friendly disposed towards the Greeks, and especially towards the Athenians and the Delians […] They say also that the moon, as viewed from this island, appears to be but a little distance from the earth and to have upon it prominences, like those of the earth, which are visible to the eye. 3 Siculus, Diodorus. Book II, 47. Retrieved 08/02/2018. Hecataeus further elaborated on the Hyperboreans as having “a magnificent sacred precinct of Apollo and a notable temple which is adorned with many votive offerings and is spherical in shape”. 4 Siculus, Diodorus. Book II, 47. Retrieved 08/02/2018. The descriptions of spherical temples have lead many to believe that it was Stonehenge which Hecataeus was describing, thus placing Hyperborea in Britain. Yet, this theory does not match with some of the more notable descriptions of Hyperborea. Many describe it as having twenty-four hours of sunlight and only one sunrise and sunset a year. 5 Bridgman, Timothy P. Hyperboreans: Myth and History in Celtic-Hellenic Contacts. 2010. Such a description places Hyperborea in the Arctic Circle, leading many to conclude that it was in fact a classical, Scandinavian kingdom. In many respects this makes sense. Certainly, the legend of Hercules involving him hunting the golden-antlered hind of Artemis in Hyperborea – reindeer being the only deer whose females bear antlers – easily locates Hyperborea in Scandinavia. Similar descriptions can also be made of Russia’s Siberian regions, where recent archaeological evidence has indicated that there existed a high level of civilisation at one point. In the Ural mountains of Siberia, in particular, some sites contain evidence to indicate that every house in the area was engaged in copper and bronze metallurgy. 6 Shah, Bipin. “Hyperborean, Vedic Aryans and new findings on related Archeology and Genetics”. 14 June 2017. 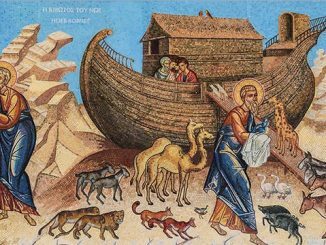 Retrieved 08/02/2018 This means that the ancient populations of Siberia were not only industrious, but lived comfortably for the time, with ovens, food storage and wells for fresh water. 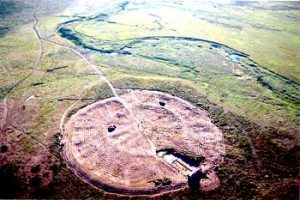 7 “Arkaim Russia- Ancient Circular Housing.” Satellite Discoveries. Retrieved 08/02/2018. Although the dates of these sites are much older than Herodotus’ writings, dating to around the second millennium BC, it does show that an advanced civilisation could have existed near or in the Arctic Circle contemporary with classical Greek culture. 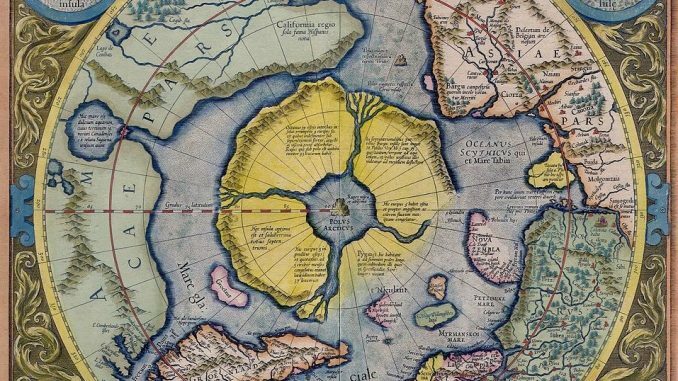 It must, however, not be forgotten that Hyperborea has often been described as an island. 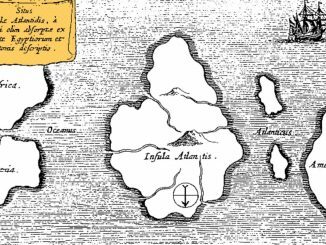 The Greeks were not the only ones to write of a mysterious island populated by a cultured civilisation. In the Irish Book of Invasions, it is stated that some of the Irish population sailed to mysterious northern islands, returning later to Ireland with new knowledge. “Bethach son of Iarbonel the Soothsayer son of Nemed: his descendants went into the northern islands of the world to learn druidry and heathenism and diabolical knowledge, so that they became expert in all the arts. And they were afterwards the Tuatha De Danann. 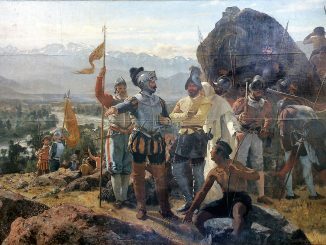 And they came to Ireland after two hundred and fifty years after leaving Ireland.” 8 Macalister. Stewart, Robert Alexander. Book of Invasions. pp. 265 and 304-306. 1938-1956. Irish oral mythology seems to be in agreement with the Greeks, in that there existed an sophisticated island civilisation somewhere in the Arctic Circle. Ancient Babylonian accounts also speak of great sages living far to the north. 9 Shah, Bipin. Hyperborean, Vedic Aryans and new findings on related Archeology and Genetics, 14 June 2017. Retrieved 08/02/2018 Even Ancient Vedic texts from India attest to an advanced civilisation of wise men living in northern lands. 10“Hyperborea & the Quest for Mystical Enlightenment.” Jason Jeffrey. New Dawn Magazine. 9 February 2000. Retrieved 08/02/2018. Whatever happened to Hyperborea, if real, is not really known. Some say that the Hyperboreans moved south over time and helped craft Celtic culture. Since the Celts are known to have migrated and settled over vast areas in Eurasia, it would help explain why the legend exists in so many cultures.